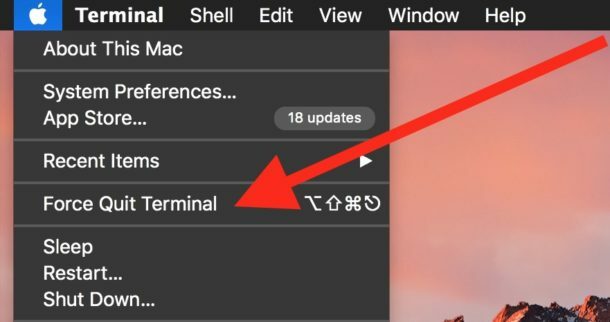 Ever wondered how to force quit apps using the Touch Bar Macs? 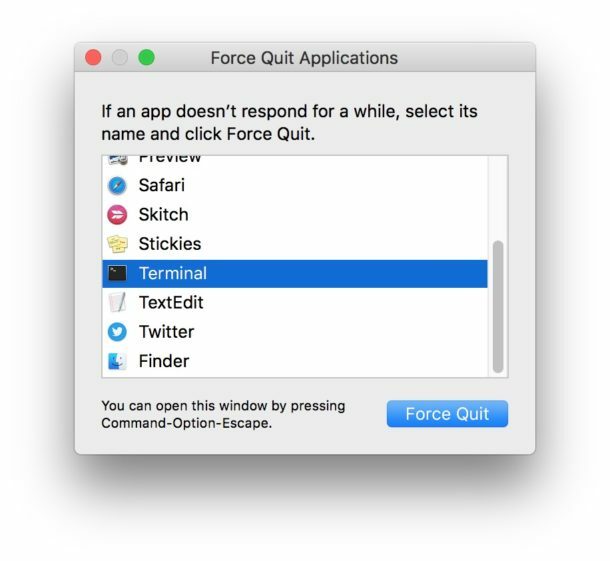 While there are many different ways to force quit Mac apps that aren’t responding, perhaps the most commonly used force quit method involves the Option + Command + Escape key sequence. But that Touch Bar Escape key is software… see the potential for a problem? 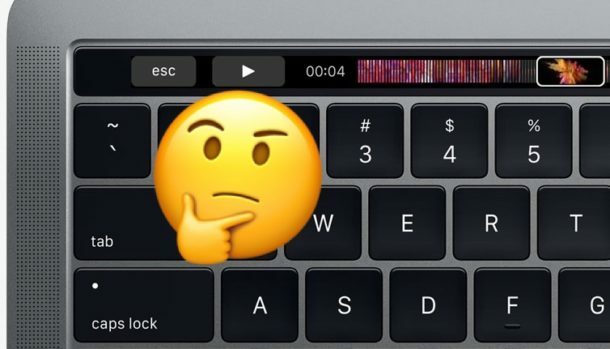 If an app isn’t responding, the software Escape key on the Mac Touch Bar is often inaccessible and unusable as well, so that deeply engrained keystroke isn’t always going to work to force quit stuck apps on Touch Bar Macs. Not to worry, if you have a Touch Bar Mac without a hardware Escape key you can use other methods to force quit Mac apps, as we’ll discuss here. First things first, you might want to try to forcibly refresh the Touch Bar on a Mac by targeting the related processes. That might revive the Touch Bar and allow you to use the virtual Escape key on the Touch Bar to force quit the Mac the usual way. You can also short-cut the Apple  menu approach to Force Quit by holding down the SHIFT key and then going to the  Apple menu and chosen “Force Quit Application Name” to instantly force that app to close. Mac OS actually offers at least 6 different methods to force quit Mac applications, and while the keystroke combination is by far the most convenient and likely a firm habit for many Pro users, it’s not always going to work as discussed here. The Apple menu option is perhaps the next best choice, followed by Activity Monitor, and relying on the Terminal. You could also connect an external USB keyboard or Bluetooth keyboard to the Mac which has a physical escape key, then trigger the familiar keystroke to force quit the problematic app. Admittedly, another keyboard is a little silly and not quite convenient. Another option would be to switch over into System Preferences and remap a hardware escape key to regain a physical Escape key to accommodate the innovative design of a virtualized escape key on the Touch Bar. Interestingly enough, Apple even mentions in their very own support document that the Escape key on a Touch Bar can cease to function thereby disallowing the ability to force quit a problematic app, and instead they recommend to either trying an alternate force quit approach or even rebooting your Mac computer. Know of another way to force quit with the touch bar Mac when the app is causing the touch bar to not work either? Let us know in the comments! I do not have a Touch Bar Mac. But, if I did, and if the Option + Command + Escape key sequence were not available, I would remap the keyboard command for this function in System Preferences. Everything I’ve seen about the touch bar just proves to me how much more I prefer having the Mac-specific function keys. I hope the Touch Bar is a BTO order option in future MacBook Pro updates because I have no interest in it at all. I use the escape key multiple times a day, I do not want a limited touch keyboard, if I did I would buy an iPad. …don’t believe the hyperbole regarding the Touch Bar, I’ve only ever needed to force quit once and the esc ‘key’ worked just fine… in fact the Touch Bar works just fine for every other purpose as well as offering many ‘new’ functions. I’d still rather have dedicated function keys. I don’t want any of the “new” functions that just duplicate on-screen options. What if it is the finder that froze and you can’t get to the apple menu? Plus the keyboard idea only works if you happen to have a USB Type C connector for the keyboard. Not too many of those around yet. You can get a hub, but plugging in something to the hub requires the finder to be working. This exact situation happened to me earlier today. Soft keys stopped working, mouse stopped working, keypad stopped working, trackpad stopped working. The only solution is to hard reboot by holding down the power key. At least the user interface idiots at apply didn’t make that a soft key. Soft keys are the most useless feature apple has come up with yet. Any app can map the function keys, why do they need to change the little pictures. Just make the laptop a touch screen and be done with it. If you’re using the dock, you can Option-Right click the application icon and you’ll have Force Quit available. You can force quit from the dock by holding down on the offending app, the quit menu changes to force quit. Check out touchswitcher app for MBP with touch bar. Adds new functionality to touch bar including the ability to press on the offending app and quitting from the touch bar. It’s free. I’d like to see a list of other touch bar apps users recommend.